At the Low Vision Institute we envision a world where people with visual conditions, such as macular degeneration have a clear path to better eyesight. We want to provide that path. For over 40 years, that’s what has driven us to develop comprehensive evaluations, therapies and devices that have allowed thousands of people to see again, and return to the activities that they only dreamed of doing. Every person with low vision is different. Their eyes are different. Their goals are different. We tailor our program to the individual and help them to have fuller, more independent lives – to see better and live better. We know that if you are reading this you probably don’t have macular degeneration, but maybe you know someone who does. Please help change their lives by telling them to call and schedule an evaluation. 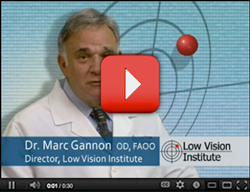 LOW VISION INSTITUTE TURNS 40! Since 1978, styles have changed, celebrities have come and gone. At the Low Vision Institute, we’ve spent the last 40 years helping thousands of people challenged with macular degeneration and other low vision conditions SEE again with our powerful RenewView® Program of unique evaluations, custom devices and restorative therapies. 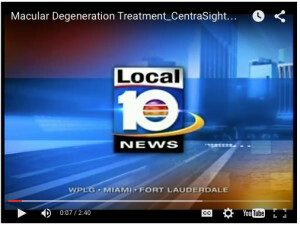 And now we’re on the first CentraSight team in South Florida. Upcoming opportunities to hear Dr. Gannon speak about Low vision. No engagements currently scheduled. © 2019 Low Vision Institute. All rights reserved.